Logging your bets is highly recommended for all users (Sure betting, Value betting and Matched betting). Display your betting history, results and profits over time. You will always know where your money is. You can find patterns and improve your strategies. When value betting you will see your expected value which will help you understand variance. Get awesome statistics and pretty charts. The below video is for Value betting, but the same procedure applies for Sure betting and Matched betting. Here you can modify the odds and your stake, if they changed during bet placement. When you click “Ok” the bet information is copied to your clipboard. You can then switch to the Excel log book and paste the bet information into a new table row. Here you can find a detailed manual of the log book and how to properly log your bets, enter your starting bankroll, logging deposits to the bookmakers and so on. 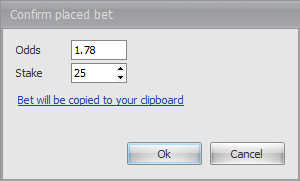 By doing this you’ll get so much more out of the log book such as ROI, Yield, percent of bankroll in-play etcetera. For Sure betting, download the Sure betting log book. For Value betting, download the Value betting log book. For Matched betting, download the Matched betting log book.